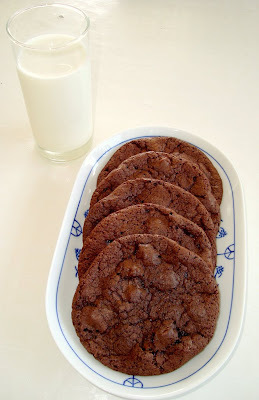 "Dough that includes semisweet-chocolate chunks and unsweetened cocoa powder helps these cookies satisfy even the deepest chocolate craving." Very true! I've had the worst sort of chocolate craving these past couple of days. And as much as I love a regular bar of chocolate, I was really longing for a good chocolate cookie or muffin. The "Double Chocolate-Chunk"-part refers to the two ways you're using chocolate chunks in this recipe; one part you melt down, the other part you fold in. 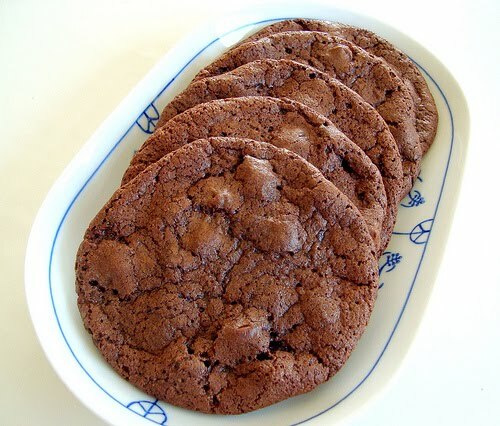 Though these cookies could very well be called "Triple Chocolate Cookies", because you use 1) cocoa powder, 2) melted chocolate, and 3) chocolate chunks. The taste reminded me of Pierre Hermé's Korova Cookies and Elinor Klivans' Totally Chocolate - Chocolate Chip Cookies, but these were much better! Rating: 5 out of 5. - Preheat oven to 325 degrees. Whisk together flour, cocoa powder, baking soda, and salt in a medium bowl; set aside. 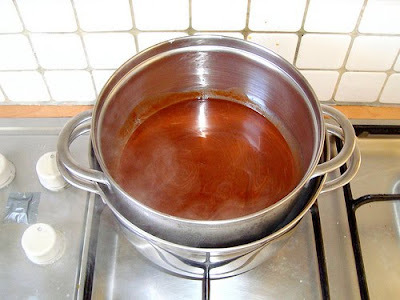 Melt coarsely chopped chocolate with the butter in a small heatproof bowl set over a pan of simmering water. - Transfer chocolate mixture to the bowl of an electric mixer fitted with the paddle attachment. Add sugar, eggs, and vanilla; mix on medium speed until combined. Reduce speed to low; gradually mix in flour mixture. Fold in chocolate chunks. - Scoop batter using a 1 ½-inch ice cream scoop; place 2 inches apart on parchment-lined baking sheets. Bake until cookies are flat and surfaces begin to crack, about 15 minutes. Transfer on parchment to wire racks. Let cool 5 minutes. 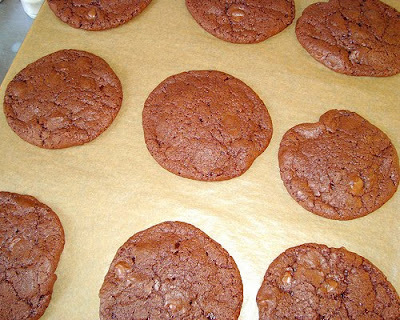 Cookies can be stored in an airtight container at room temperature for up to 3 days. Chocolate & butter; perfectly melted. the chocolate bits melted and the center was sooo soft! The texture of these cookies were simply wonderful! Crisp on the outside, gooey & chewy on the inside. Mmmmm...these look absolutely scrumptious! Thank you for sharing. I really enjoy this wonderful place you've created here. The aromas simply waft straight through my computer monitor. Tis quite lovely! These look chewy and gorgeous! The texture on these looks absolutely perfect! I'm definitely trying these soon. mmmm wowza these cookies look like my type of cookies, they look so filled with chocolate as well yum! ik wil ook zo graag deze koekjes bakken of ook maar iets. maar heb geen baking soda in huis...zou het ook zonder lukken, hmmm. look delicious! @lian: Misschien wat gist in de plaats? Ik denk dat je er ook zonder kunt ... Of een recept uitzoeken dat geen baking soda gebruikt! Oh what glorious chewy gooey goodness is this?! I must have them :). Btw, I'm following in your footsteps with a CSN giveaway too. OMG your blog is dangerous. Think I just gained 5 lbs by looking :-). 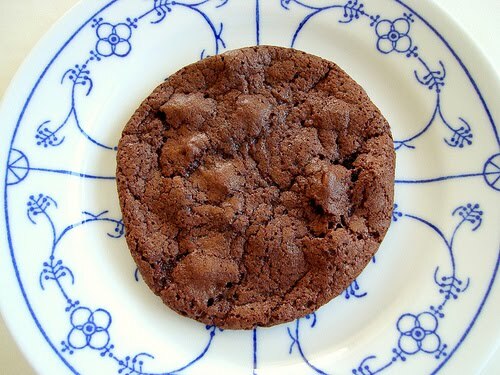 These chocolate cookies look divine. Yum! @Anonymous: Hi there! If they won't flatten on their own, you just need to flatten yourself a little bit. I like to use the bottom of a wine glass to press them down a bit, right before they go into the oven. Hope this helps!